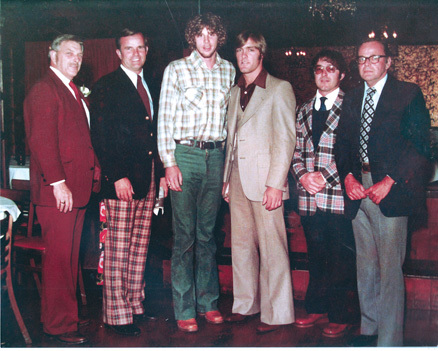 This photo, taken at a banquet for Fidyrich in Northborough in 1976, is included in Wilson’s book. Shown (l-r) are Paul Fidyrich, Tom Blackburn, Mark “The Bird” Fidyrich, Bruce Kimm, Jack Wallace and Ted Rolfe. Mark “The Bird” Fidrych is a local baseball legend, rising from the diamond at Algonquin High School in Northborough to become a major league pitcher for the Detroit Tigers. While at Algonquin, Fidrych was coached by Jack Wallace, who now serves as the Town of Stow’s Health Agent. 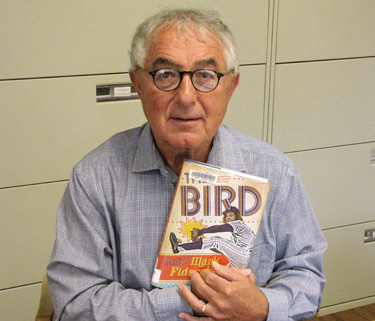 Wallace was one of the sources for the new book “The Bird: The Life and Legacy of Mark Fidrych,” by Doug Wilson. After his baseball career ended, Fidrych returned to Northborough and became a businessman, active in local fundraising efforts until his accidental death in 2009. Wallace said the book was “an emotional read” when he received a copy earlier this year. “It was interesting knowing so many people in the book, knowing how difficult the end of his career was, and then knowing how he died at such an early age,” he said. Stow’s Health Agent Jack Wallace was Mark Fidyrich’s High School coach. career. “He was a good pitcher, but not as a result of my tutelage or coaching. He had natural ability and good velocity. He kept his pitches down and threw strikes,” he said. “I come off in the book as being pretty tough and I probably was,” he said, adding that times were different in the 1970s and Wallace was still maturing as a coach. “We had to address an 18- year-old drinking age. We called it pretty tight,” he said. In the book, Wallace contributed his thoughts on the length of Fidrych’s hair and his initial (and ultimately unnecessary concerns) about Mark’s ability to fit in with a team. “He was a pretty popular guy. His teammates loved him,” he said. Wallace said when he was first contacted by Wilson two years ago, he didn’t answer the phone displaying an unknown number from the Mid-West. However, once Wallace began to speak with Wilson, he was reassured of the sincerity of the project. “He appeared credible and was credible,” said Wallace. When Wilson came to the area to conduct research, Wallace met the author and served as tour guide. “I showed him around the school grounds and the local areas,” he said. Also mentioned in the book is Mark’s sister, Carol, who many children from Stow know as Mrs. Duda, a teacher at the Center School. Wallace said he taught Carol, Mark and Mark’s wife, Ann, while a teacher in Northborough, along with most of Mark’s other siblings. He eventually even taught Mark’s daughter Jessica, but has since retired from teaching biology and coaching. “I wanted to leave before I taught someone’s grandchild,” he laughed. Wallace said he was interested to learn the details of Fidrych’s path after he left high school. “When I read the book, I was amazed with the way he progressed in baseball,” he said, adding he hadn’t realized the impact the current Tiger’s manager, Jim Leyland, had on Fidrych while both were in the minor leagues.